I’ve been wanting to make these for quite some time now. I had ordered the soap pump dispensers a few weeks ago, but just had not had the time to get around to making them until this week! My sweet hubby gave me a helping hand and we had all six done in no time flat! 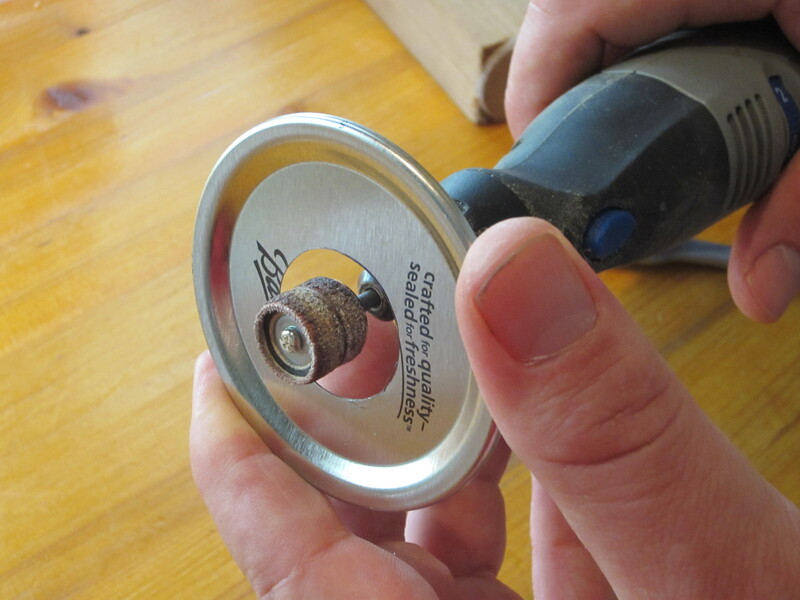 Using the piece of wood, place the lid (aka seal) onto the piece of wood and, being very careful (wear gloves, if you have them), hold the lid tightly. 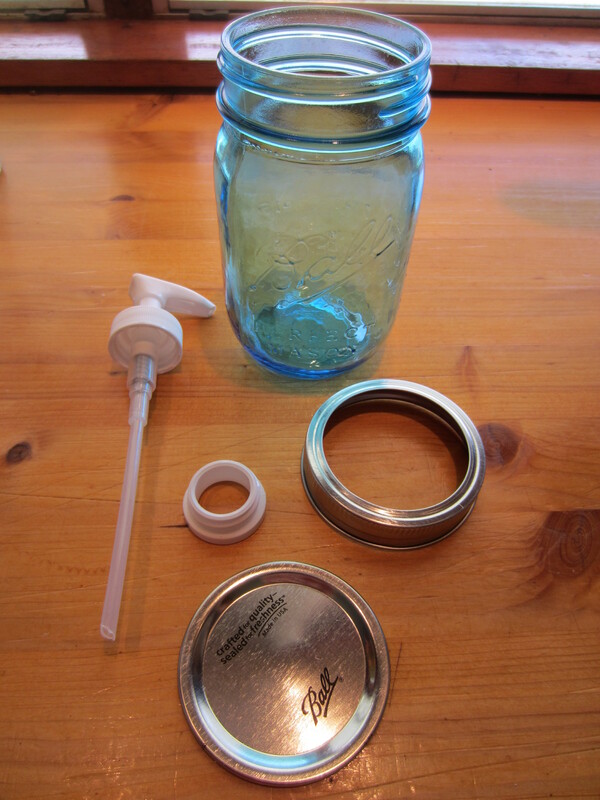 You will actually run the drill backwards to keep it from grabbing the lid as hard. 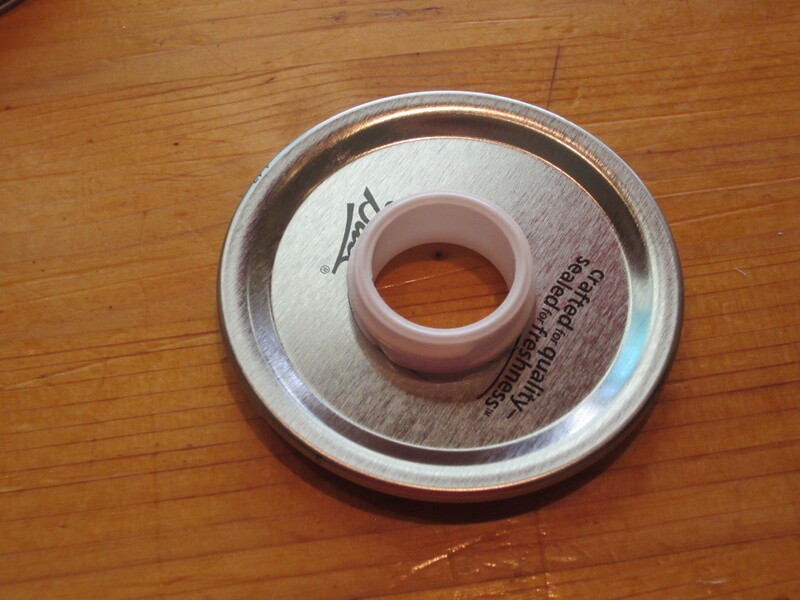 It makes a nice, clean hole without you having to fight to hold the lid in place as much. 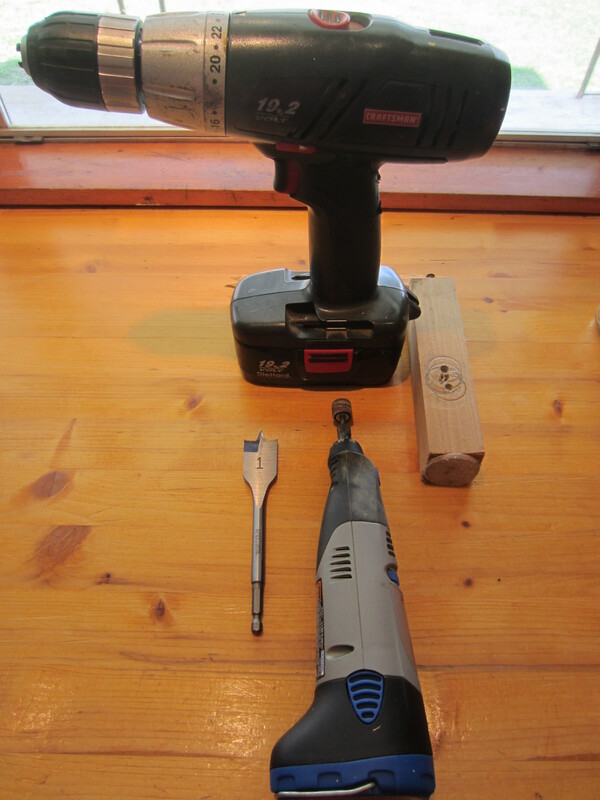 Next, you will want to take the Dremel & file down the edges. 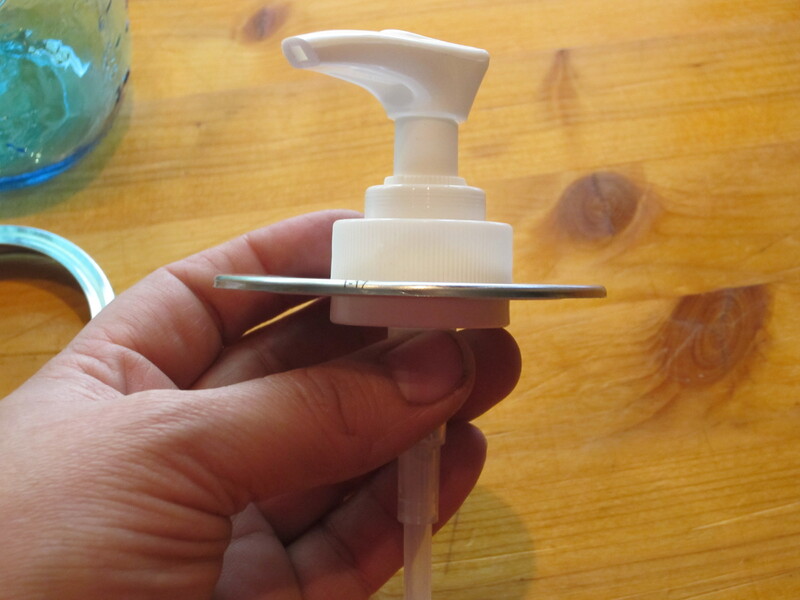 Once you are done, see if the collar of the soap pump fits through the hole. 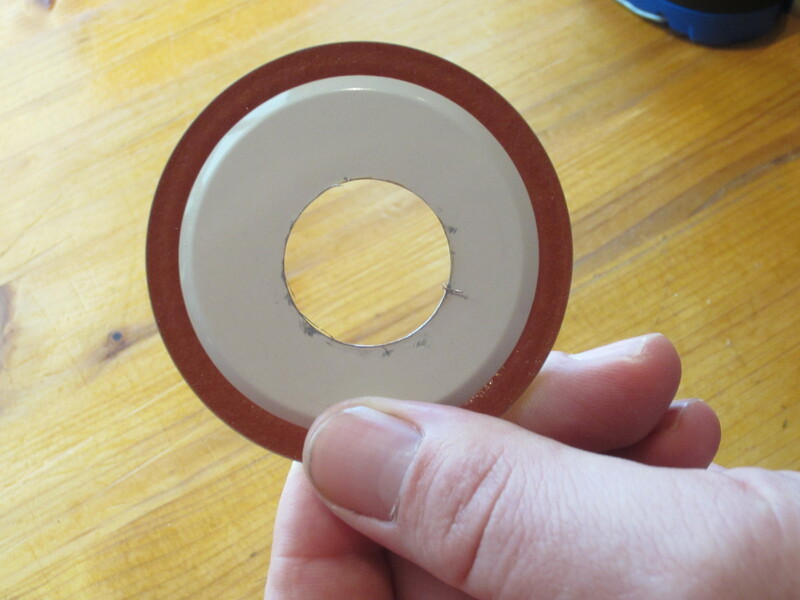 If it won’t quite fit, use the Dremel to file down the edges of the hole you cut just until the collar slips through. Be careful not to make it too loose. 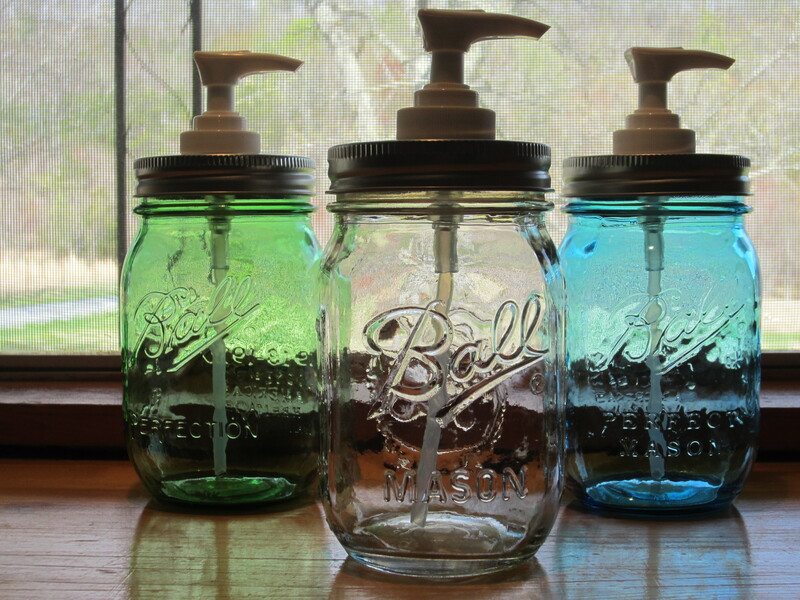 Fill your jar with your desired soap, place your dispenser onto the top of your jar, screw the band in place, and you have a beautiful soap dispenser! 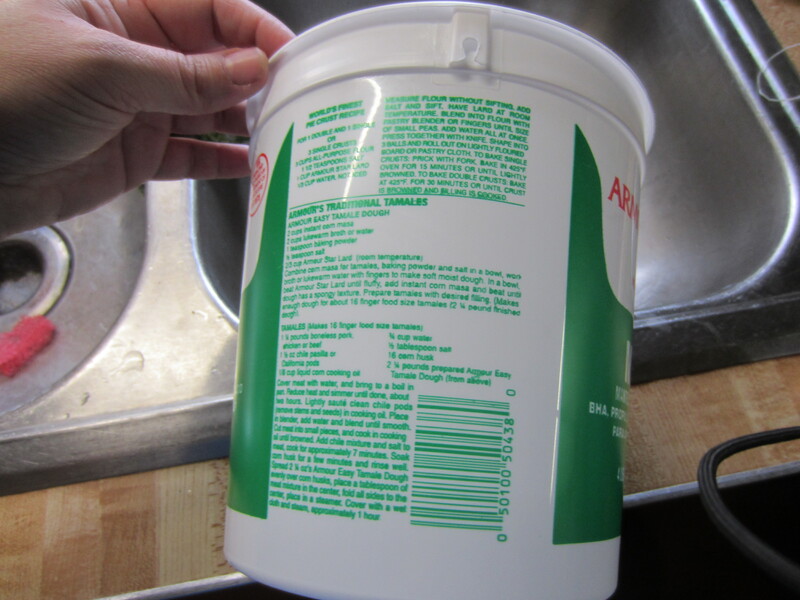 I had an empty lard bucket that I wanted to do something with, and then I had a brilliant idea! 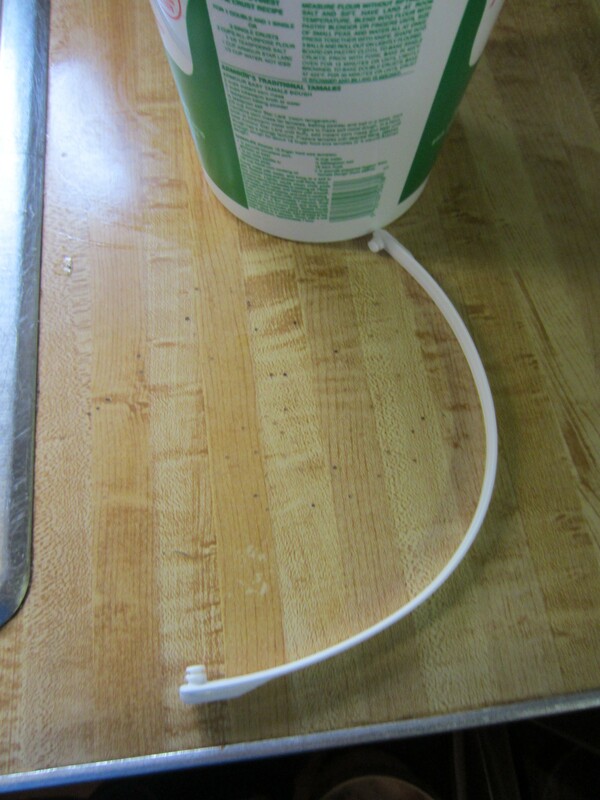 Start by removing the lid and handle from the bucket. Next, give it a good washing in hot soapy water. You’ll probably need to wash it a few times. Once it’s nice and clean, allow to completely dry. 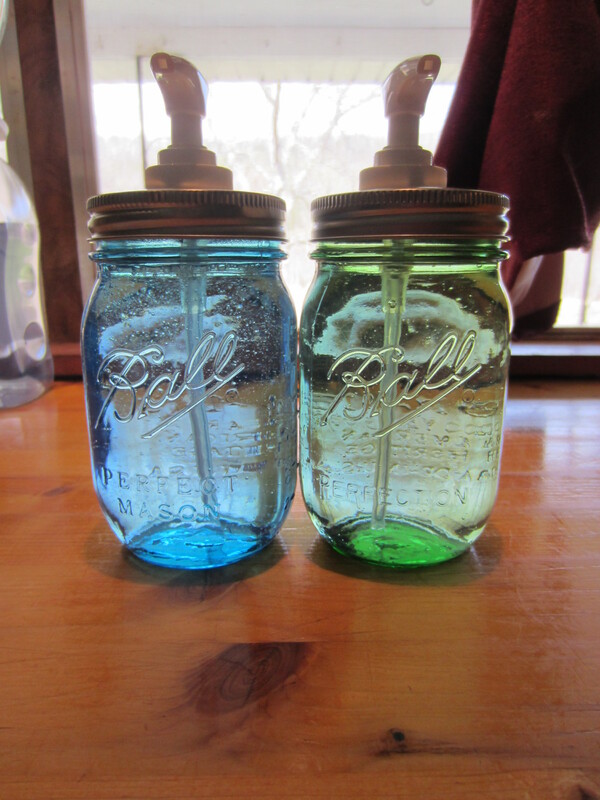 Take outside and spray paint desired color. 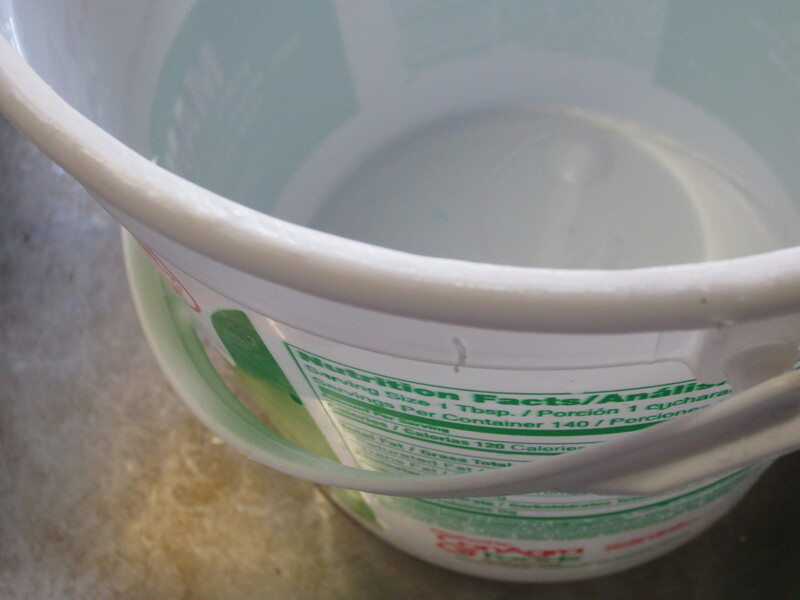 You will probably need to paint a darker bottom to hide all the colored inks in the bucket itself. I used black as the bottom coat on mine. I also painted my lid and handle black. Once dry, I placed the letters where I wanted them & began painting my second color. I painted both the inside & outside of my bucket red. 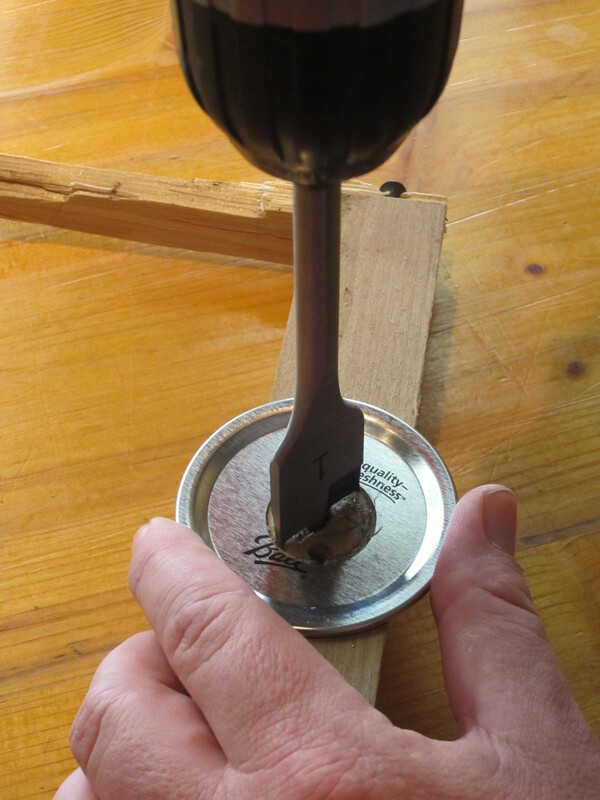 Once it was completely dry, I brought it inside & reattached the handle. 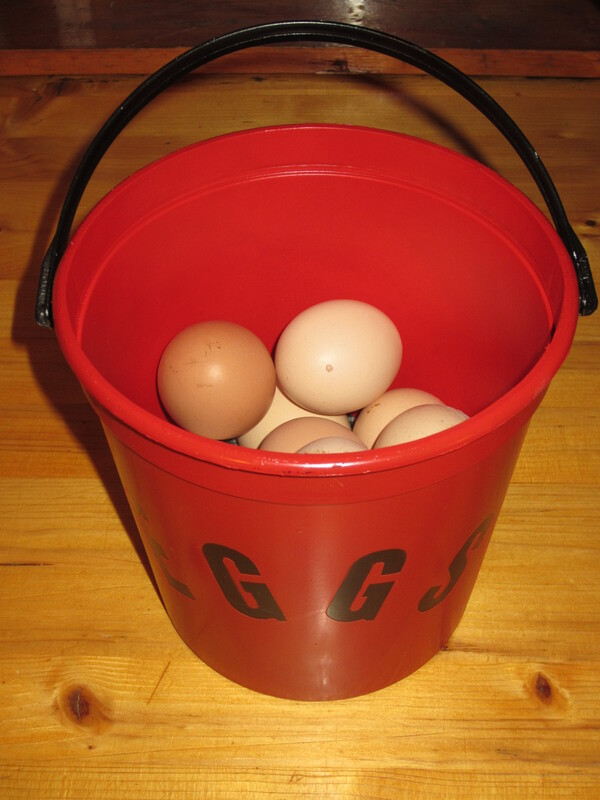 I also made this little “cushion” to go in the bottom of the bucket to keep the eggs from making contact with bottom of the bucket – hopefully to keep down on any “accidental” cracking of the eggs. Voila! 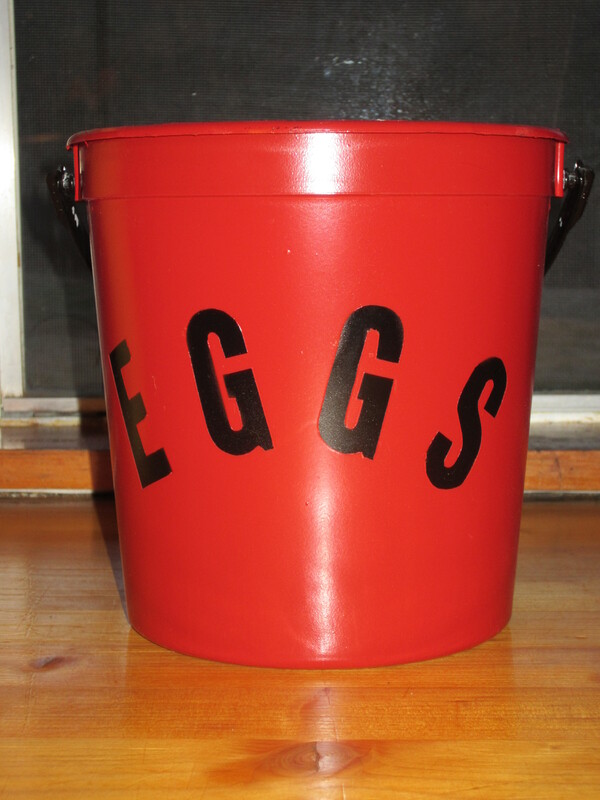 My new egg bucket! I love it! 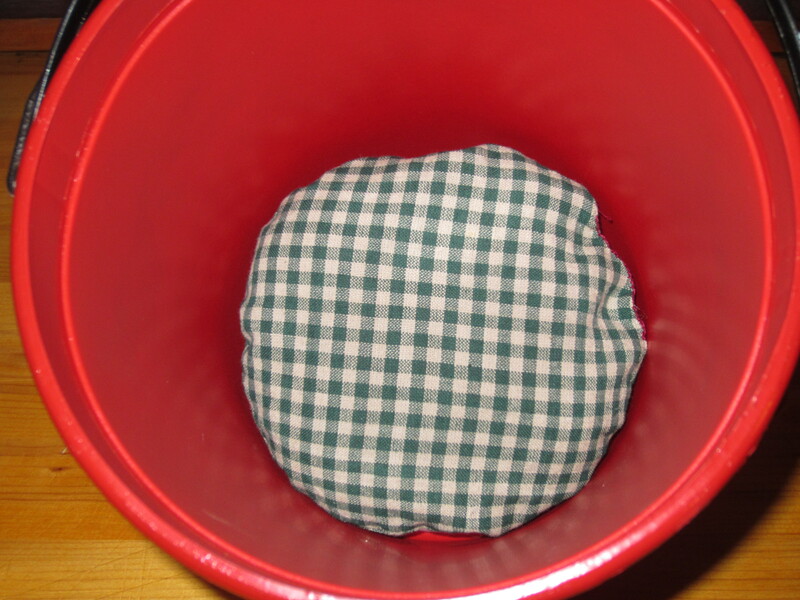 I may just have to make a few more of these as I come across empty buckets! I can finally post pictures of my latest baby blanket. Getting it washed, gift-wrapped, & ready to go to this precious little one was easy – delivery is another story. Even though we don’t live that far away from each other, it’s not easy to get together. Well, my oldest daughter recently changed jobs & is working at the same company as the daddy of this precious little one. So, I sent it to work with her on Wednesday. I wish I could show you a picture of the little one that this was made for, but I can’t until the adoption is final. He’s so precious! And, I’m sure he’s grown quite a bit since I last saw him! Here is his blanket! And just in time for the cold weather, too! When I asked mommy & daddy what colors they were using in the nursery, they said they were doing a Bible story theme, so no specific colors. When I asked if they had any favorites, the reply back was, “bright colors!” So, that’s just what I did! I just love how the colors turned out! 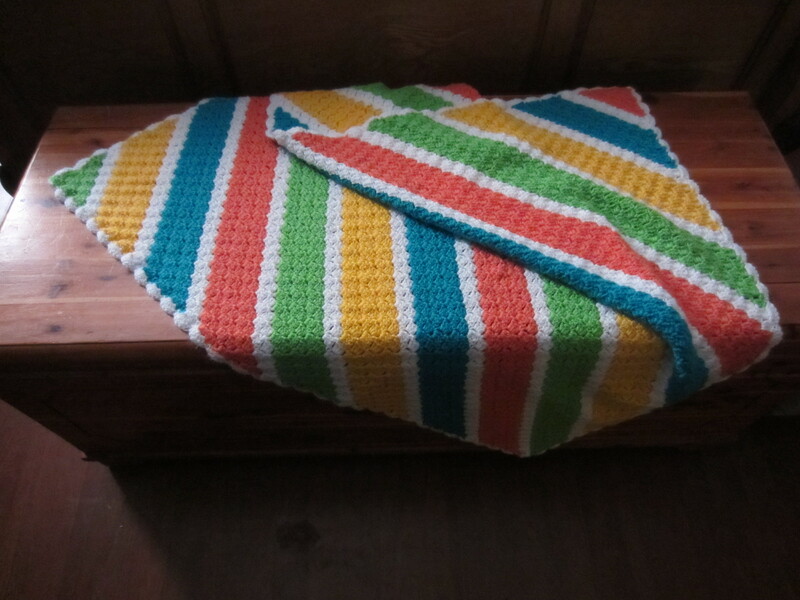 It was a little tough to give it up since the color were so pretty, but I know know sweet little Arlin will enjoy this blanket for many years to come. 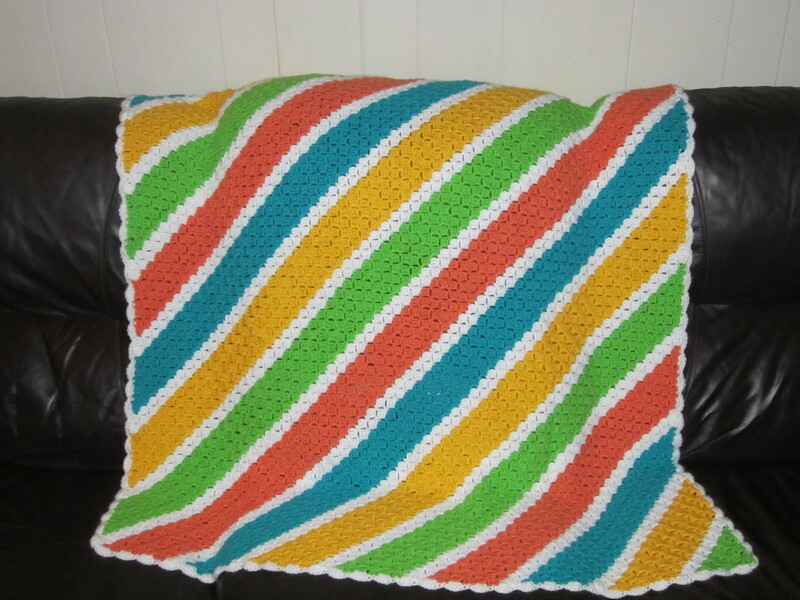 And, I always make my baby blankets about toddler size so that the blanket can be used for a long time, and not just for a few short months. Welcome to the family, Arlin! For a precious baby boy…. Some dear friends’ of ours recently had their first baby, a sweet baby boy. I wanted to do something special for this sweet little one. 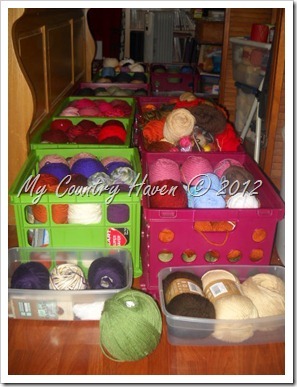 So, once I found out the nursery theme, I got out my hooks & yarn & set to work. His nursery theme is a nautical theme, so the colors I chose worked out beautifully! 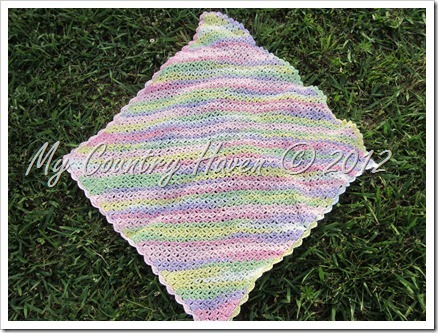 The first blanket is an Ocean Waves pattern that is extremely versatile. But, the waves pattern fit with what I was looking for. 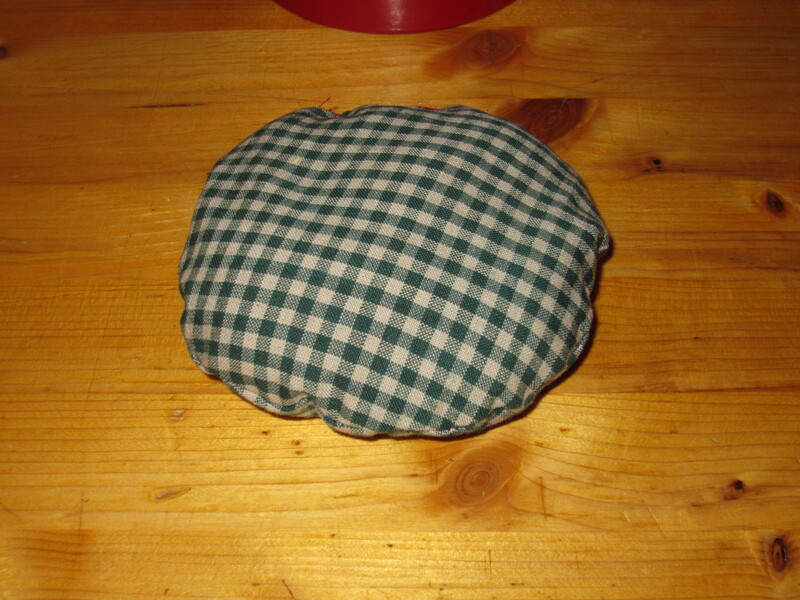 It’s rectangular shape makes it so that it can easily be used with a car seat, swing, etc. I ended up making two because I came across this next pattern and just knew that I had to make it for the sweet little one, as well. I ended up having just enough yarn for both! 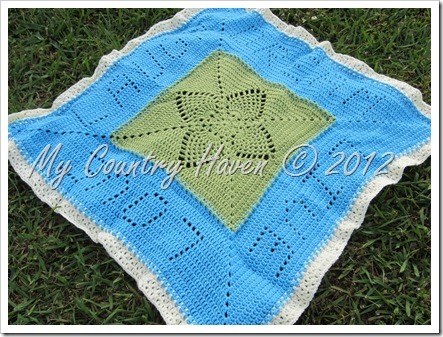 This pattern is called Chromium Star Blanket. By using the same colors, it reminds me very much of fireworks! I was so please with how they turned out, and mom & dad loved them! I pray that their precious little boy has many years of enjoyment out of them. Our local county fair was later this year than normal, and the entries were only about 1/3 of what they normally are. This makes me sad because I so enjoy seeing what everyone makes each year in all the different divisions. It was also a little disappointing, especially since my afghan was the only one entered in my division. In the rules, if there is only one entry, it automatically takes 2nd place. So, not only was I surprised to see mine as the only entry, but I was also surprised to see a blue ribbon! No matter. I absolutely love my afghan and am looking forward to curling up with it during the cold winter days with a good book or my next crochet project & a nice cup of hot tea or hot cocoa. 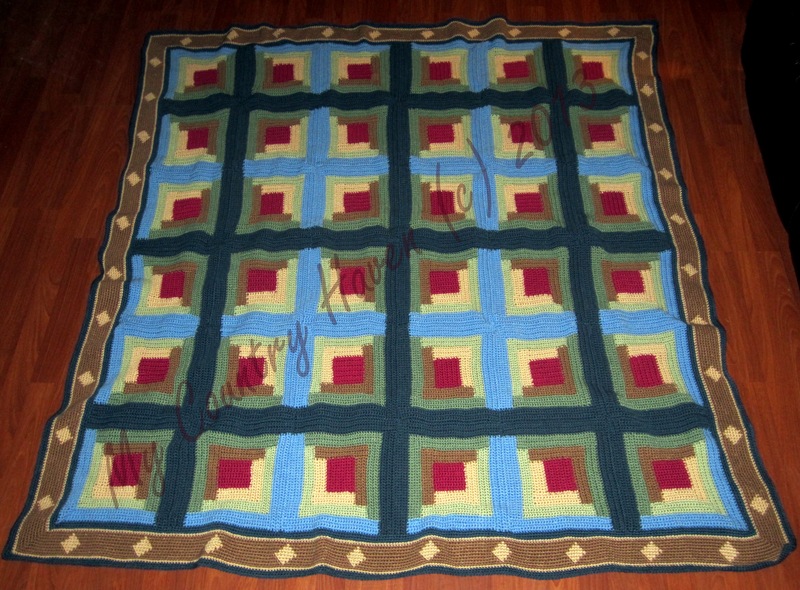 I patterned after the log cabin quilt pattern: sunshine & shade. I love how the colors came together. The border is my own little added touch. No pattern for it – just the one that came together out of my head! Those who know me know that I absolutely LOVE to crochet. It is a passion of mine, and I have to be careful that it doesn’t take up too much of my time. I can get so caught up in working on something that I don’t realize just how much time has really passed. A couple of months ago, I was able to test a couple of blankets for one of my favorite designers, Donna Mason-Svara aka Smoothfox. 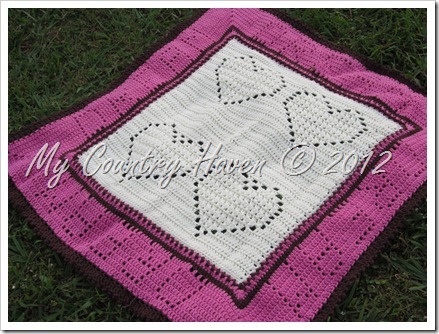 I also made a diagonal baby blanket (A Red Heart Pattern in my Crochet Today magazine). Both of the pink baby blankets went to my cousin Brooke, who is expecting her first baby in July! The blue & green one is still patiently waiting for a forever home. Hi! My name is Steph and I’m addicted to yarn! Anyone who knows me knows that I love to crochet! Well, over the last few years, my yarn stash has really started growing. Well, today, Melia was looking for some yarn for the graph-gahn that she would like to make for Michael for his birthday next month, so she turns to her favorite source of yarn, her mom’s stash! So, while the majority (no, this isn’t all of it) of it was out, I decided to do a bit of “housekeeping” and reorganize it & take a couple of pics. And then I thought I would share them with you, dear followers. 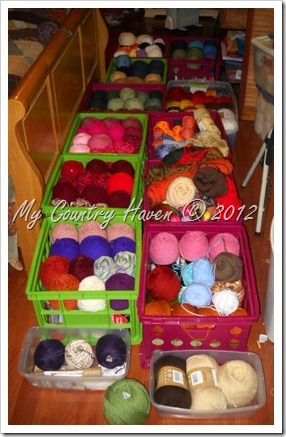 I know other yarn addicts lovers would appreciate these pics as much as me! My color palette is not as widely varied as it has been in the past since I really hit it hard over Christmas, but who knows. Maybe I’ll add some more fun to my stash this year. 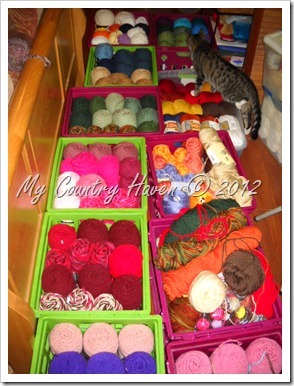 Even one my kitties had to come see what mom was doing with all of this delicious yarn!